Greetings from the New York based North America liaison office of the University of Cologne! Together with other liaison offices of German universities we are planning a series of events across the US in 2019. 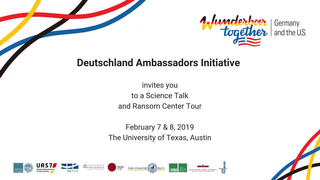 These events will be part of the Wunderbar Together Deutschlandjahr 2018-19 initiative. Our events will feature expert talks, networking opportunities, and, exhibits. The Deutschlandjahr USA is a collaborative initiative funded by the German Federal Foreign Office, implemented by the Goethe-Institute, and with support from the Federation of German Industries (BDI). Our first event will take place on Thursday, February 7, 2019, at the University of Texas, Austin. If you are in the area, please join us. Let’s be Wunderbar Together! Julia Clarke is John A. Wilson Professor in Vertebrate Paleontology at the Jackson School of Geosciences, The University of Texas at Austin and a Howard Hughes Medical Institute Professor. She is interested in how new structures and functions arise in deep time with a focus on the evolution of dinosaurs including birds. Her research has been funded by the National Science Foundation, The Gordon and Betty Moore Foundation, The National Geographic Society, Explorers Club, AAAS, Howard Hughes Medical Institute and has been covered by NPR’s Science Friday, The New York Times, Washington Post, National Geographic Magazine, NOVA, and other outlets. Dr. Clarke is a recent Humboldt Foundation Award Winner (2016). She is a Fellow of the Royal Society of Biology and received her degrees from Brown University and Yale University. Dinosaurs: Ancient Fossils, New Discoveries: Prepare to take a journey of discovery into the exciting world of modern paleontology with Dr. Julia A. Clarke who will highlight new discoveries in this field and their implications. New imaging techniques are changing what parts of dinosaur biology we can study and the questions we ask about them. In her research at Berlin’s Museum für Naturkunde, Dr. Clarke spent her summers collaborating and working with their key animal sound archive and bird collections. In her talk, Dr. Clarke will focus on how we study sounds and colors in these magnificent reptiles.